As the nights are getting warmer, these bright and zingy corn on the cobs are great on BBQ’s- but even better in a wood fired oven! You cook these at any temperature in the oven, but we love the caramelised flavours that come about from the high heat cooking. You can bake these cobs whilst cooking pizzas with the high heat and a rolling flame, or you can let the temperature come down should you prefer- just adjust the times accordingly. The butter can be made a day before, simply mix the softened butter with the smoked paprika, chopped chilli, lime juice and zest, season well, and wrap tightly in cling film to set in the fridge. When you’re ready to cook the corns, lay out 2 double sheets of foil, drizzle with oil and salt, and pop 2 corns in each. Top each corn with a good chunk of the butter and wrap tightly. Pop the two foil parcels on a tray, and place into your wood fired oven, on the opposite side to your fire for around 15 minutes. Once the time is up, remove the foil, place your corns onto the tray and cover the them with the juices from the foil packs. Return to the oven, tossing regularly, and cook for a further 5-10 minutes until they’ve browned nicely. 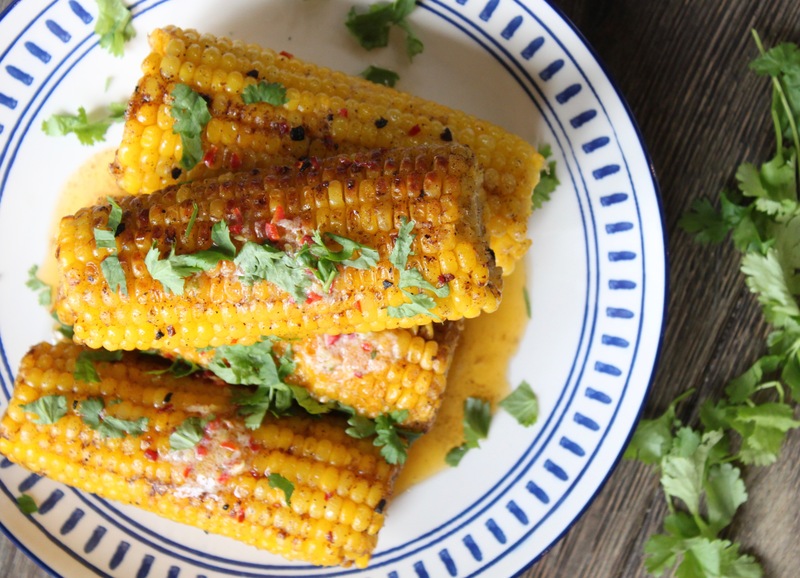 To serve, add another thin slice of butter to each corn and sprinkle over some coriander. Delicious!